Happy first day of spring! (For those of you in the Northern Hemisphere, of course). I’m still on my self-proclaimed spring break, planting poppies and savoring strawberries. Making art and lingering at an outdoor cafe. Planning a weekend adventure at the beach. In the midst of all this, it occurred to me that you might be wondering why I’m making such a big deal about spring. I mean, it’s great and everything, but why all the fuss? Well, for me, the arrival of spring holds deep psychological meaning and far-reaching symbolism. It reminds me, like nothing else does, of the essential call of self renewal: Emptying out. Letting go. Making space for what’s new and blossoming. 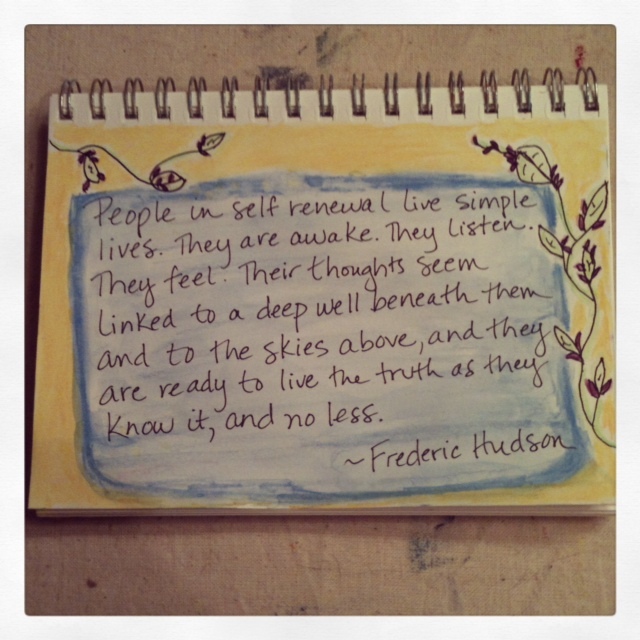 You could even say that self renewal (the act of renewing yourself) is at the core of the work I do with clients. Now, the coolest thing is that an under-the-radar piece I wrote well over three years ago–Ten Qualities of Self Renewing Adults–has suddenly become popular. In it I pay homage to Frederic Hudson, whose work on adult development and self renewal hooked me many years ago. Back then I said his list of qualities required for continuing self renewal was a gem. It still is, and I hope you get a chance to read it, right here. And on this glorious first day of spring, I wish for you a life well-lived and a continuous flow of self renewal. Hi! Want monthly-ish resources for Living Deep delivered straight to your inbox? Subscribe here. And by all means, please follow me on twitter: @pattybechtold. Great post ~ very creative and educational ~ hope Spring comes to New England soon ~ all we seem to get is Snow and more snow ~ lots of ‘gestation’ time ~ enjoy ^_^ and thanks for coming by . Thanks so much, Carol. Good reminder for me, too, because I sometimes forget that not everyone is experiencing this early spring we’ve been having in N. Calif.
the planting is going so well and I just love looking at all the newbies in the ground! Thanks for asking Sara. It would be so fun to go on spring break with you! I was raised in the Unitarian church and we always celebrated Easter as the coming of spring. I now attend a different denomination, but that association is still inbred into me. I’ve been thinking a lot about it as I’ve been enjoying my practice of radical gratitude for all the signs of spring afoot–such beauty everywhere! Nature’s renewal is amazing. Yes! I just was reading about how all this good stuff that happens in the spring gets us in touch with our wise, wild intuitive self. I love that.